Olea Europaea (Olive) Fruit Oil*, Beeswax (Cire D'abeille)*, Cocos Nucifera (Coconut) Oil*, Simmondsia Chinensis (Jojoba) Seed Oil*, Natural Flavor, Butyrospermum Parkii (Shea Butter)*, Stevia Rebaudiana Leaf/Stem Extract*, Tocopherol, Helianthus Annuus (Sunflower) Seed Oil*, Vaccinium Angustifolium (Blueberry) Fruit Extract*, Fragaria Vesca (Strawberry) Fruit Extract*, Prunus Persica (Peach) Fruit Extract*, Linalool1. 1Component of Natural Flavor. *Organic. Certified Organic by Oregon Tilth. Patent Pending. On the EOS website, they currently only ship to destinations in the US, Canada, United Kingdom/Ireland, Australia, New Zealand and Mexico. Shipping to USA is a flat rate of $2.75USD while to all other destinations is a flat rate of $15USD. So if you live in Canada and would like to order from the EOS website, it will be $ $3.29USD + $15USD Flat Rate Shipping to Canada. ---- WOW! Expensive!! In Canada, they were found at Shoppers Drug Mart and RW&Co. However many locations has been sold out. 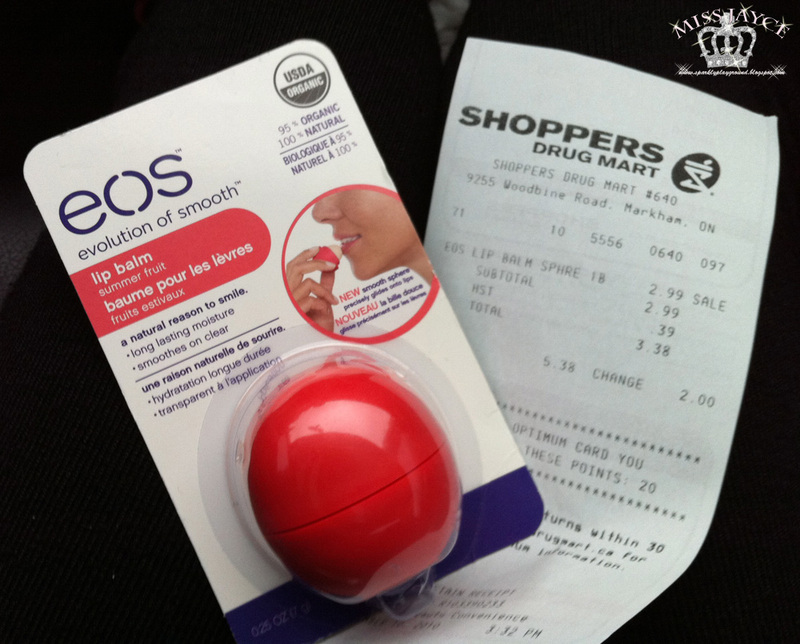 RW&Co carried the package of 3 retailing at $14.99CAD. I asked both retailers' managers whether the lip balms will be restocked. Their response is that, the lip balms were an extension to their regular line of products thus they may not be restocked. ---- Let's hope they come back soon!! In USA, they can be found at Target, Walgreens, RiteAid, CVS, Drugstore and more. I went to Target recently but I did not find any at the Buffalo locations. I also found some on Amazon and eBay. Amazon don't seem to be able to ship to Canada while eBay sells at ridiculous prices. I heard great things about this lip balm and was so excited to finally try it! 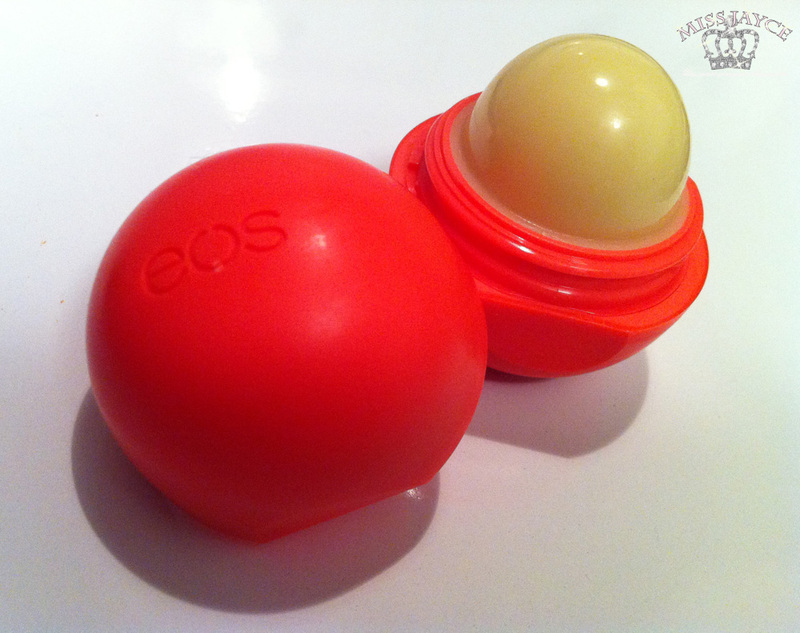 EOS lip balms, unlike many lip balm companies on the market, prints exiry dates on their products. Mine is 10/2013. In terms of application, it is not easy to apply on fresh exfoliated lips, rather it was a bit stiff. I do tend to over apply lipbalms so eventually it becomes smooth. It is not smooth and glossy like vaseline but when you start to rub your lips together, it definitely sinks in (melts) and your lips are nice and smooth immediately. I liked that I didn't get a heavy waxy or sticky feeling like I did with Blistex, yet provided a healthy, moisturized lips shine. I also liked that it doesn't have an oily or greasy feeling I get when I use vaseline. Ps, I was researching EOS lip balms and found out Ed Westwick from Gossip Girl also uses EOS lip balms! How cool is that! Product: 5/5 ♥ Fits with description perfectly. Price: 5/5 ♥ Price is Reasonable, but hard to find. eBay prices are crazy high!